With summer winding down, now is a great time to perform a bit of maintenance on your deck. The reality is that your deck will show signs of wear and tear after being exposed to the weather for several years. By taking the following steps, you can make your outdoor space look like new again! Wash – HGTV advises that before doing anything else, be sure to remove dirt and wood fibers with a pressure washer. Quick tip: Keep the pressure stream moving when washing or you could risk damaging the wood. Once you’ve finished, allow the deck to dry overnight. Fix nail pops – Take a look around your deck. Are there any nails that have come loose from a board? If that’s the case, carefully remove the nail with a hammer. Remember to use a screw that’s longer than the nail to re-attach the board. Repair split wood – If your deck has a board split down the middle, mark the damaged board next to the leading edge of the first support joist that’s past the split. Just don’t mark an area directly over a joist or you could damage your saw when you start to cut. Once you’ve finished cutting the replacement board, it may appear higher and wider than the existing wood. However, it should shrink as it loses moisture. If you don’t see any change after several weeks, it’s pretty easy to smooth it down with a belt sander. See that all nail or screw heads are recessed into the wood prior to sanding. Stain and steel – Though premium-grade, treated lumber resists insects and decay, it’s still vulnerable to moisture and the sun’s rays. To maintain the lumber’s color, use a clear wood preservative that contains a UV protector. Doing so will give the surface new life while also shielding it from Mother Nature. On the other hand, if you want to add color, use an exterior stain first. Apply the stain with a roller or brush, let the product sit on the decking for about 20 minutes, and then go back with a brush to give the deck a more consistent finish. The application of a second coat provides an extra layer of coverage and protection. Once the deck has tried for 48 hours, you can move on to applying a sealant. 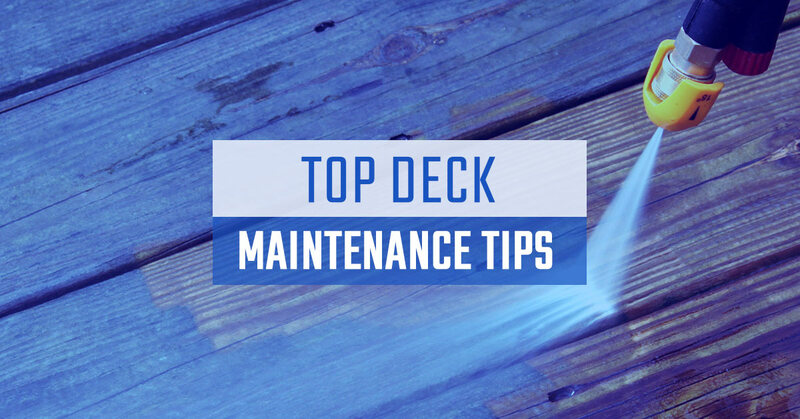 Unfortunately, performing the aforementioned tasks may not be enough for decks that are damaged and in need of major repairs. That’s why more folks nationwide are trusting Ready Decks as their go-to deck builder. Since 2001, our local deck builders have worked to provide the highest quality site-built decks in the shortest time possible while offering homeowners the greatest value. Nearly two decades later, that mission has stayed the same. We’ve come in contact with many homeowners who have been duped by unprofessional decking companies in the past. You don’t have to worry about that with Ready Decks! When you get paired with a deck installer, rest assured that we will provide the ultimate consumer experience, which is summed up in quality, value, and integrity. Every day, our team is installing beautiful, affordable decks for homeowners. Don’t be stuck with that unsightly, worn-out deck any longer. Instead, give our deck contractor a call today.